Seal Cottage is located in a most exclusive part of the Beara peninsula, Waterfall, Castletownbere, West Cork which has a long history. It overlooks a private beach and has spectacular sea views. On the eastern side of Seal Cottage lies Waterfall House. It was the official residence of the Royal Naval commodore of the Western Approaches squadron, anchored in Berehaven. It was purchased a number of years back by the film director Neil Jordan who spends much of his free time there. Beside Seal Cottage lies the Hermitage, built just after the Second World War. It was built on the site of a farmstead - Curryglass House, dating back to about 1800. Erskine Hamilton Childers, President of the Irish Republic and son of the IRA man Robert Erskine Childers, stayed in the house periodically with the owners his friends. - large utility room with Miele washing machine, dryer, large freezer and storage for household goods. There is an entrance to garage off the utility room. - Large double bedroom downstairs with walk-in wardrobe and large en-suite with shower, toilet, wash basin and Jacuzzi bath overlooking the lawn and sea. There are also patio doors opening on to a private patio area from the bedroom. - large conservatory with a range of tropical trees such as banana trees etc. - there is zoned electric under floor heating in all downstairs areas. There is a Bose surround sound system which also has the option of being switched on in the conservatory area. - There is a solar heated swimming pool in the garden which is available for use from 01-Apr to end-Sep depending on weather and a traditional Scandinavian sauna in the woods. - There is private access to the beach down steps at the eastern side of the site. - There is a private mooring for a boat. - the entire site is wooded with a natural walkway through it. - There is also a stream flowing through part of the woodland which had been used to create a miniature lake. 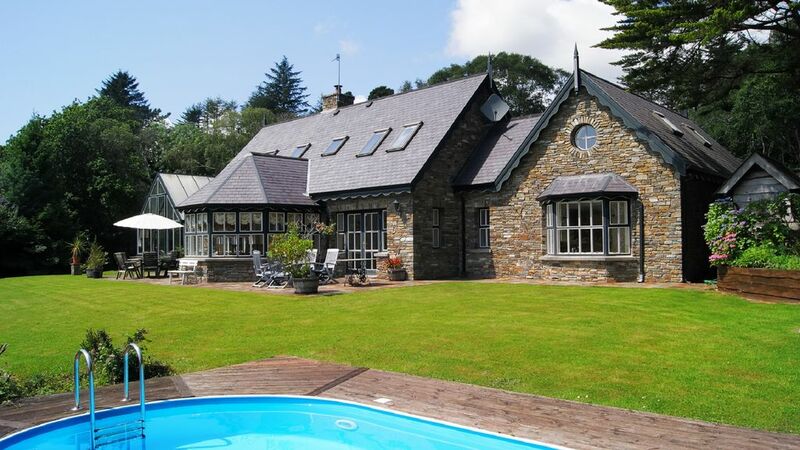 This property was perfect for comfortably accommodating our large group of 8. We had lots of room both in the cottage and outside. The place was very clean and comfortable and the owner had left plenty of logs for the fire and had even came the day before to put the heating on to pre warm it for us which was a nice touch as it was a very cold day! The garden views and private shingle bay below were amazing with seals on the rocks each morning and we had some great weather to enjoy it. What a wonderful place. Peaceful, luxurious, on the ocean, great house with a warm and welcoming host. Nearby the local town and on route to some of the most wonderful scenery in Ireland. Highy recomend! The home had more than I could have expected in a stunning part of the world. Well cared for with great appeal! Customer service was excellent and I would definitely recommend this property to any of my friends or relatives who wished to stay in the Castletownbere area. Beware! Dirty! Rundown and overcharge! We have staid at about a dozen holiday homes over the last couple of years. Some very nice ones. This was the worst. The house has a nice architecture but is run down at many corners. When we arrived we had to face a sticky kitchen floor, pots with food remains in the closets, a part of the stove half full with cold grease. We showed it to the care taker. He apologized. We made pictures and sent them to the owner. He was not available. After we left he wrote us that he will look into the issues and charged us 80 Euros (!) for cleaning. Also he charged for rubbish disposal what is not mentioned in the offering. The landscape is in much worse condition as the pictures are suggesting. Many bushes have overgrown limiting view and use. Obviously somebody stopped taking care of land and house some time ago. We cannot recommend this house for obvious reasons. We had an amazing time at your lovely house and grounds. We could feel ourselves relaxing the moment we arrived. The kids never left the pool. Your groundsman was very helpful and always available to help with any questions we had. The sea views from all rooms is so enchanting. We have shown your site to many of our friends and hope to stay with you again in the future. “Thank you for the warm welcome we received upon arrival. We have had a lovely holiday. It is truly a ‘mini paradise’ here. The accommodation is very comfortable. We loved exploring the grounds, in particular we loved the privacy and lovely walks with scenic mountain and sea views . Looking forward in coming next year during the summer with kids. They will enjoy the pool and beach down below. We will return for a longer visit next time. Many thanks. My housekeeper is there to meet all parties on arrival and go through all aspects of their stay with them. They are also available during your stay should you have any on-going questions. I'm glad you enjoyed the house and private grounds. You are most welcome to stay again next year with your family.